The player can split his action points as he wishes between the mother and the babies that are awake. A raptor can never move onto or move through a space where there is a fire token. 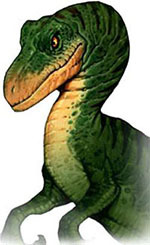 Only active raptors (represented by figurines that are standing up) can perform actions. A player does not have to use all of their actions points. In fact, they could decide to use no action points at all. With one action point, a baby raptor can move onto an empty, orthogonally adjacent space. If by doing so a baby lands on one of the half-space of an L-shaped tile, it escapes. It is removed from the board and the Raptor player is one step closer to victory. 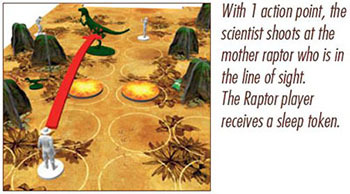 With one action point, the Raptor player can move the mother as many spaces as he likes in a straight line as long as she doesn't run into an obstacle (rock, fire token, space occupied by a baby raptor or by a scientist). If the mother is wounded: Before performing her first move, the mother must loose as many action points as the number of sleep tokens she has already received. 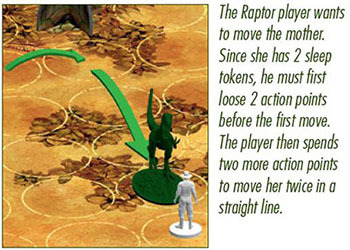 If the Raptor player does not have enough action points left to do so, the mother won't be able to move. With one action point, the mother can kill a scientist located on a neighboring space. The figurine of the scientist is removed from the game and put back in the box. Only the mother can attack the scientists. She can perform several attacks in the same turn. With one action point, the mother can wake up a sleeping baby raptor located on an neighboring space. The figurine is set back to an upright position. The mother cannot wake up a baby that was put to sleep in the same turn. The woken up baby can immediately be moved by using action points. With one action point, the mother can use her tail to put out a fire present on a neighboring space. The fire token and all other fire tokens orthogonally connected to it are removed. The player can split his action points as he wishes between the scientists present on the board. Scientists can move through fire and shoot across fire, but they cannot end their turn on a space occupied by a fire token. Only active scientists (with a figurine in an upright position) can perform actions. Very important!! Each scientist can only perfom one aggressive action (shoot or capture) per turn. A player does not have to use all of their actions points. In fact, the player could decide to use no action points at all. With one action point, a scientist can move onto a free orthogonally adjacent space where there is no other scientist and no raptor. If that space contains a fire token, the scientist can move through it but cannot end his move there. With one action point, a scientist can be set back to an upright position, but not on the same turn it was frightened. This scientist can immediately be used for other action points. With one action point, a scientist can shoot at a baby raptor located on a neighboring space and put it to sleep (its figurine is laid down). With one action point, a scientist can capture a sleeping baby raptor located on a neighboring space. The baby raptor figurine is removed from the board and put on the upper left space of the Scientist player aid. With one action point, a scientist can shoot at the mother raptor. The scientist can shoot orthogonally in a straight line as far as desired as long as no obstacle is in the line of sight. The only obstacles that can block the shot are rocks and other active scientists. 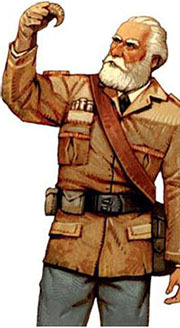 A scientist can therfore shoot across a frightened scientist or across a small baby raptor. The Scientist player then gives one of his sleep tokens to the Raptor player who places it "Zzz"-side up on the upper right space of his player aid).